Ueber die multiplen Fibrome der Haut und ihre Beziehung zu den multiplen Neuromen. Festschrift zur Feier des fünfundzwanzigjährigen Bestehens des pathologischen Instituts zu Berlin. Herrn Rudolf Virchow. Recklinghausen, Friedrich Daniel von, 1833-1910. Berlin : August Hirschwald, 1882. Description : viii, 1-138 p.,  l. pl. ; ill.: 2 photo., 3 litho. (part fold.) ; 25 cm. Photographs : 2 leaves, lichtdruck (collotype). Subject : Peripheral nerve sheath — Genetic disorders ; Generalized neurofibromatosis. Author caption: dargebracht von F. v. Recklinghausen. Professor in Strassburg. Eponym: Engel-Recklinghausen disease — generalized osteitis fibrosa (GM 4358). Eponym: Recklinghausen's canals — the lymph canaliculi (GM 1108). 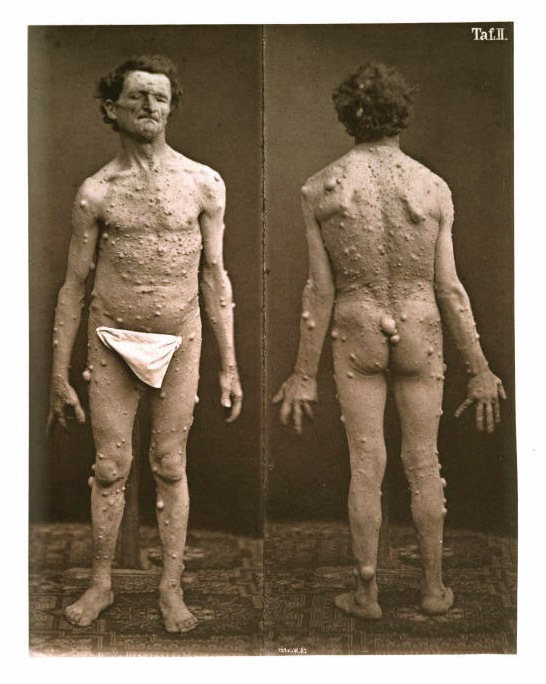 Eponym: Recklinghausen's disease — neurofibromatosis type 1 (GM 4082, 4566). Eponym: Recklinghausen's tumor — adenomyosis of the uterus (IM 21403351110). First to describe haemochromatosis (GM 3916). Index Medicus: 11110491390, 11408901320, 21701511270. Presented are two cases of multiple neurofibromatosis — less precisely called fibroma molluscum — and an extensive review of the literature including cases of local neuroma, plexiform neuroma, and multiple fibroma. An important study on nerve tumors was written by Robert William Smith (1807-1873) titled, A treatise on the pathology, diagnosis, and treatment of neuroma (Dublin: Hodges & Smith, 1849) and it was in this work of Smith and of others — including Recklinghausen's teacher, Virchow (1863) — which suggested that fibroma molluscum was a disorder of nerve tissue. 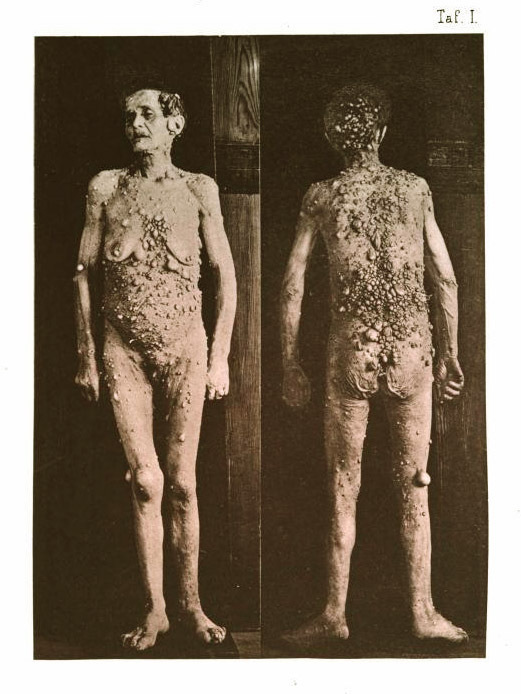 However, it was the histological evidence provided here by the brilliant Recklinghausen which provided the definitive picture, revealing how neuromas catenate on the sheaths of peripheral nerve trunks and alter cutaneous nerve filaments.